Shop Heet Sound Plus EBow Electric Bow for Guitar from AMS with 0% Interest Payment Plans and Free Shipping. The Energy Bow is a totally unique guitar accessory. It's not just an effect like the many plug-in devices on the market. The EBow does its work on the string itself by producing an energy field that vibrates and sustains your guitar string... Direct String Synthesis. Infinite Sustain is just the beginning. Powered by a 9-volt battery, the EBow is held in place of your pick, giving you instant access to violin, cello, flute and horn sounds as well as unique sounds of its own. The EBow lets you play as fast as your left hand can scurry through a lick. Fade a string in from a motionless state for a reverse-tape effect. Run the EBow across the strings for gorgeous arpeggios. Add distortion for a screaming guitar sound. Playing the EBow directly over the pickup will increase your volume many fold and give you the crisp sound of super hot pickups. Moving away from the pickup gives you the mellow sound of a hollow body electric. The sounds you discover by experimenting with the EBow will amaze you. And like the best tools of the trade, the EBow will sound different for each musician. To hear the EBow right now, check out the MP3 files in our resoures category further down on the page. The EBow now comes with a complete Player’s Guide booklet and detailed cassette lesson by EBow virtuoso Lenny Walker. How does he get those sounds? Now, Lenny shares his secrets in this feature- packed personal EBow lesson...by the master of EBow technique. Any record cuts feature EBow? There's EBow on the Chili Pepper's Falling Into Grace and One Big Mob, Elton John's The One, Van Halen's Spanked, Soundgarden's Black Hole Sun, Def Leppard's Stand Up, Metallica's Unforgiven, Heart's Barracuda, and you can here Michael Manning use it on bass on Adhan. Click here for Record Cuts featuring Ebow List. eBOW! Get one for the studio, not your gig bag. There's nothing like this thing and you can get some amazing sounds but be advised - it takes practice. You may not get greatness right out of the box. That said, these are great for getting unique sounds - especially useful for ambient and sound design. I wouldn't recommend this for live work unless you feel very comfortable with this. For work in the studio, it's awesome. Apparently this has been around for years and Here I am at 49 years old and just now finding out about it. But I'm very happy with it! Highly recommended... The secret weapon. Outstanding. I have been involved with this product since the seventies. You own the tone with this. Very versatile. Fantastic. I was able to open the box, insert a battery, and dance on the strings. Nice finish. We started with chrome. It has stood the test of time. I can personally vouch for 36+ years of use. The quality is good. It doesn't seem to require a super strong battery to power it and my old ebow lasted for years before I lost it. The ebow is a one of a kind device. There have been small improvements over the years that make it easier to use and easier to control the sound. If my first Ebow lasted over 20 years, this one should as well. It's a solid piece of equipment that has been around for generations & has the same construction & appears to be better wiring than my last one. I had my first Ebow for 20 years, this new one is generally built the same, & the battery cables (what finally pulled out on my first one) are better lined within the device. I got an ebow for a graduation present over 20 years ago & it has lasted until recently when the battery cables finally came loose. I've used it for a couple recordings over the years to obtain a sustain without having picking breaks, and to mimic synth strings and feeback. I use it live on my song "The Author of Fate" (http://www.youtube.com/watch?v=w_NKdpHDhxM) & find that times where you want feedback sustain, dropping this into a recording is essential. It may start a little hard to use & figure out as you find the best "sweet spot" & attack for your guitars, but this is almost like learning a new instrument. The latest version of the Ebow features the harmonic setting, which my old one didn't have. This adds more dimension to the effect & your playing, & allows for some great sustain effects. As someone who uses wah, talkbox, and acoustic guitars in my music, the Ebow is another great addition to my palette and sound. Using an Ebow is awkward, holding the device on the strings as opposed to holding a pick. I have trouble using the Ebow on the high E or low E/outside strings because there's nothing to balance on. Finding the "sweet spot" on the guitars is tricky, & changing strings is tough. But if you're used to picking, it's a very foreign approach. This isn't like stepping on a stomp box & changing some knobs, it's like learning a new instrument. You're trying to "bow" the strings & it's a challenge, but it really enhances your sound & playability. Tone is up to you, just about anything is obtainable if you're willing to work with it. The included CD with .mp3's, web lessons, and instructions really help to understand the instrument. Again, you can hear/see mine being used live at youtube.com/gtrdayve on my song "The Author of Fate". My first EBow was black, & pictures the last few years have shown them as white. The new one came black, it's not bad being black, & the construction is the same. However, I wish I could have gotten the white plastic version, because the black one doesn't show up on stage as well! When grabbing it in stage lights...& more importantly...having it seen from stage so the audience can say "what's that thing he's using on his guitar" it makes it a little harder to see on the stage! But music isn't about the visual presentation, right? Like I'd said, the new version has a higher sensitivity and response, & produces a greater output. It appears to be made OK, but not great. I'd give it 3 out of 5. I've only had it a week. It doesn't appear to be the most sturdy product. I hope I don't drop it. I just got this last week, and I'm having a lot of fun. However, I mainly play acoustic, and was looking forward to gigging with this thing. I can only consistently get the B string to vibrate as soon as I put the Ebow to the string. G string is almost as good. High E string is good, but it's a little tricky to get it in the right position compared to the inner strings. Another thing: The Ebow effectiveness goes down as the string tension increases. A capo on the fifth fret makes it more difficult to get a string vibrating, and when I fret past the 12th fret, the Ebow often times just doesn't work. On my electric guitar, however, it works much more consistently across the inner strings. It's still tricky to position the Ebow correctly on the high and low E strings. Worked perfectly and dependably within a minute of unpacking it. I use my Ebow with piano, and it works beautifully. It doesn't quite fit the width of piano strings (but it's not designed to), but the tone is lovely. Good - though it should be noted that it's black and not white as pictured. Its made out of plastic...but a tough plastic. I mean, you hold it in your hand so you want it to remain light...so I have no problem with it, but I do think if it was dropped on a hard floor there would probably be some damage. For what it is though, no complaints. Simple, two settings...standard and extra harmonic. I always seem to use the harmonic side. Very "Pumpkin-esque". Definitely worth its price. Its found its way onto some of my newer recordings already after a couple weeks. Smooth, basicly it just gives an endless sustain to your original signal through the standard setting, and the harmonic setting pinches the signal quite well. Pretty sounds either way. 10 years guitar/drums/keys/programming/bass, etc etc. The package has all you need - eBow, small instructional booklet with extensive list of tips, audio tape with examples. Once you insert the battery, you're ready to play. 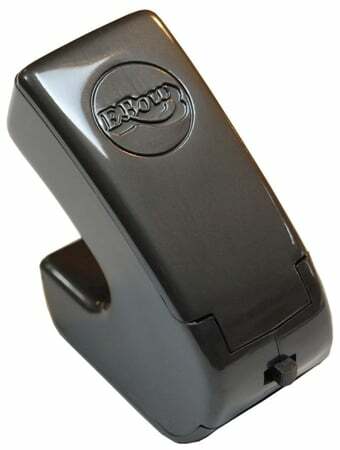 This is eBow plus, which is the 4th version. Having the switch between normal sound and harmonics is a nice add-on. "Cool" blue LED helps when you're playing in the dark (position of the eBow with respect to the pick-up is crutial so seeing the distance helps). It's easy to get started. I was afraid that it will take some 'trickery' to get the right sound and I'll get discurage before I get to know how to play it but that wasn't the case. You have to practice however to get full control and take advantage of eBow's potential. Like they say in the instructions - volume changes can be drastic.